Back in 2011 when Tiger & Bunny was airing, someone made a typo during the stream chats. 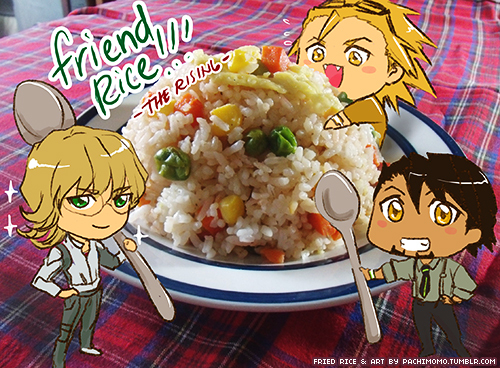 “Fried rice” turned into “friend rice” and that typo stuck. When we here at This is Sternbild put together the first Friend Rice Event after episode 24 had aired, the typo just seemed to fit the event. And everyone who took part in that event made it history. Thank you, and again thank you, everyone! Thank you, staff & cast of Tiger & Bunny! We love and support what you do! for The Rising (and maybe even season 2)…!